Have questions about your Galaxy Audio equipment? Check here to see if your questions have been answered. Q: What are Galaxy Audio’s warranty terms? Q: I’m having issues with my Galaxy product, what do I do? Q: When recording using my AXS mixer via USB, how can I monitor the audio that is going to my computer? Make sure all SOLO buttons are up in the monitor section and only the MAIN button is down. 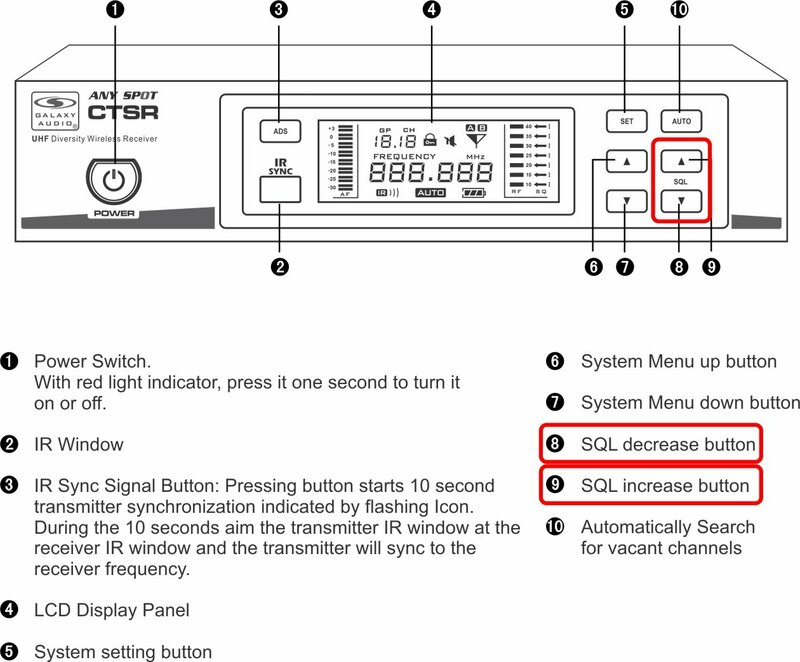 The 2-TK/USB and 2-TK/USB TO MAIN buttons are only for playback of incoming audio, not for monitoring USB output. Q: Why can I not hear any of the DSP effects I am trying to preview on my AXS mixer? AXS-14: To hear the DSP effects, you must have the yellow DSP knob adjusted to level on each channel you wish to hear the effect as well as the yellow FX SEND knob next to the effect selection display. Once you have adjusted these knobs, slowly bring up the yellow FX/AUX 2 fader to preview the desired effect. AXS-8, 10, 16, 18: Adjust the yellow DSP knob to level on each channel you wish to hear the effect. Adjust the yellow DSP knob(s) in the AUX Sends and the Stereo AUX Returns section to level to preview the effect. 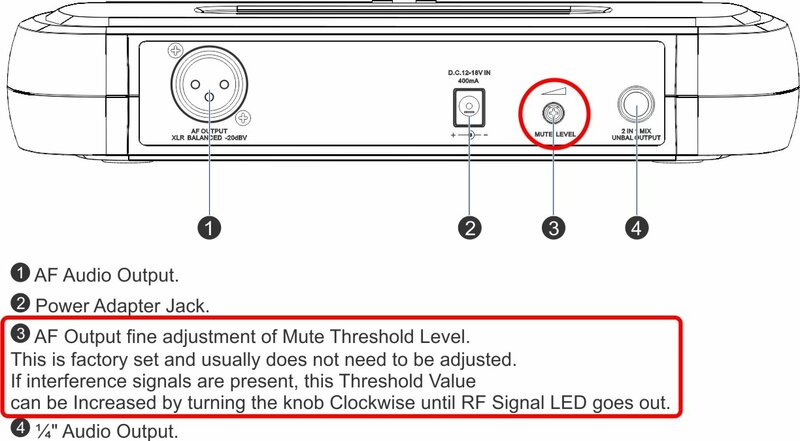 AXS-8: Make sure the MUTE ALT3/4 is in the up position. If it is pressed, it mutes AUX Send 1 if your channel is set to Post-Fader. You can find additional information in the manual about AUX/FX send busses on page 11-16 and the DSP on 21-22. Q: How many HS7 can I connect together? It depends on your amplifiers rating. If it is rated to run at 4ohms, the maximum number of HS7 is 4, if your amp is rated to 2 ohms, you could use up to 8 HS7. Q: My HS7 isn’t balancing as a wedge and keeps tipping. The included Rubber Feet can be applied to the bottom of the HS7 for better balance and friction when used as a wedge. Q: How many HS4 can I connect together? It depends on your amplifiers rating. If it is rated to run at 4 ohms, the maximum number of HS4 is 4, if your amp is rated to 2 ohms, you could use up to 8 HS4. Make sure the Phantom Power switch is on. Q: I’m using the XLR input on my MSPA5, but it is distorted and I can barely turn it up before it is too loud. Q: Will I get left and right when plugging my MP3 player into the 1/8" jack of my MSPA5? Yes. It sums the two together. Q: How can I mount my PA6BT to a wall? Q: I do not get output on the Thru jack when using a 1/4" input on my PA6BT. The Thru output is only for the XLR input. Q: Can I use a condenser microphone with the PA6BT? Yes, there is 24VDC Phantom Power on the XLR inputs. 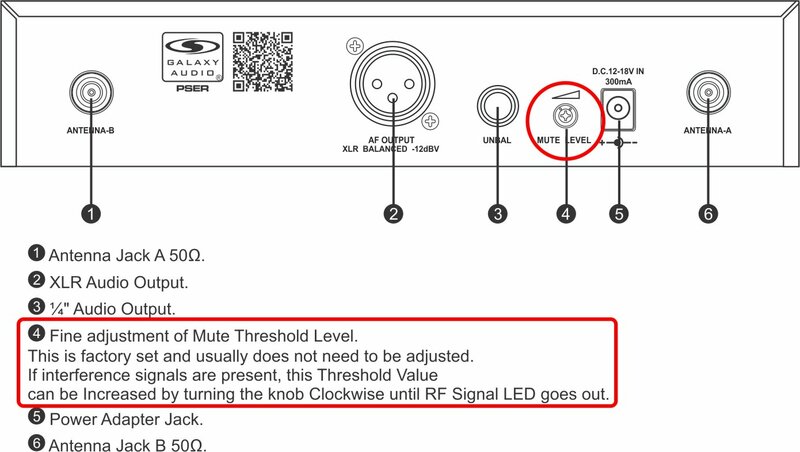 Q: If I turn the PA6BT off, will I have to reconnect my Bluetooth® device? No, the PA6BT remembers the last device it is paired with and will automatically reconnect. Q: Can I pause the music from my Bluetooth® device using the PA6BT? Yes, when the music is playing, press the Bluetooth® button once. It will pause the music. Press again and it will resume. Q: On my PA6BT, I have connected to the 1/4" input but I have no output on the XLR thru jack. The XLR thru jacks are paralleled with the XLR inputs, the 1/4" does not pass through. Q: Can the 24Vdc Phantom power be disabled in the PA6BT? Yes, but it is a modification that must be done by the Galaxy service department, so not to void the warranty. Q: My PA6BT is too loud when barely above 0! If using an XLR connection, use the -20dB pad switches located on CH.1 & CH.2. If you are able, you can switch from XLR to 1/4". There is a -16dB difference on the 1/4" input. If either is not enough of a reduction, you can try dialing back or padding the output signal at the input source such as a mixer. If it still is not enough, you can use an in-line pad. In-line pads are available at most musical instrument suppliers. Q: Can I use my PA6BT to power a passive extension speaker? The PA6BT uses all its amplification for the internal speakers, there is not power available for an external passive speaker. It does have an aux out that can be used to connect to another powered speaker. Q: Can the GPS-8 be used outside of the US? Yes, but you must change the mains switch to the proper voltage for your location. Q: Can I plug a microphone directly into the GPS-8? Yes, but it must be a dynamic mic. There is no Phantom Power for condenser mics. Q: I am attempting to self-service my Hotspot (to install a new handle, replace a speaker, install a VC/attenuator switch, etc.). How do I open the monitor without damaging the unit? Self-servicing should only be attempted on passive versions; HS7, HS4, MS5, and the older models HSRG, HSVC. HS7, MS5: From the back of the unit, remove the 4 screws in the recesses of each corner. The shell (back) can then be slightly separated from the bezel (front). Disconnect the input jack wires from the speakers to allow complete removal of the bezel from the shell. This will allow for enough working room to replace a VC switch or speaker. HS4, HSRG, HSVC: Remove the 6 screws in the front bezel, and separate the bezel from the shell. On the HSRG and HSVC you will need to tap the front corner of the unit against the workbench to separate the bezel, it is very tight. Q: Can my amplifier drive the 16 ohm HOT SPOT speaker safely? According to the specs, the amplifier is only rated for 2, 4, and 8 ohms. Yes. 16 ohm loads are LESS demanding on amplifiers. Two 16 ohm Hot Spots would present an 8 ohm load to the amplifier. Four 16 ohm Hot Spots would present a 4 ohm load. Q: I just purchased my first HOT SPOT, and I think it may be broken. My HOT SPOT does not have any low end response. I sounds very "middy". Is this a common problem? The HOT SPOT was designed to be "middy" (midrange); we call this Controlled Bandwidth. The purpose of the HOT SPOT is for near-field vocal monitoring. The Controlled Bandwidth eliminates the low end in the HOT SPOT so we can target the vocal frequency range. If you are looking for more low end in a compact monitor, our PA6BT Powered Hot Spot features a 6.5" Woofer and 1.5" Tweeter for a more full range sound. Q: I need to replace the speaker in my Hotspot, but the S5N-8 looks different than the one in my Hotspot. Will the S5N-8 work? The S5N-8 Neolite Driver can be used as a direct replacement for an older S5C160-8 and vice-versa. Both speakers are identical in power handling and voicing, but the Neolite is the newer technology and about 2 lbs. lighter. If replacing one speaker in a passive Hotspot that has 2 speakers (HSVC, HSRG), it is recommended that both speakers be the same model for proper weight balance. Q: How do I power my HS7, HS4, or MS5? Q: What is the plastic piece on the bottom of the Hotspot for mic stand mounting? I’ve lost mine and need a new one. Some mic stands will require the MSA-1 adapter which can also be purchased from the store. Q: I think I may have a problem with my headset mic or cable. What is the best way to find the specific problem area? If you suspect a headset/cable issue, have the headset connected to your system in a way that you can hear the audio output – a low but audible level is recommended. Then, try gently bending/wiggling the cable along its length as well as the headset itself, paying special attention to where it is connected to your device and where the cable connects to the headset. If you can find a spot where bending the cable or headset consistently causes popping or unwanted noise, you have identified a problem in the cable or headset. A problem at or near the cable/belt-pack connector junction may only need the connector wiring recut and re-soldered. A problem along the headset itself will require further service and possibly a replacement. Q: I'm trying to wire another brand headset mic to work with a Galaxy Audio wireless microphone body pack. What is the pin out? The pin out is as follows: Shield to Pin 1, Audio to Pin 2, and a jumper (solder bridge or straight wire) between Pin 2 and Pin 3. Q: I have a headset with a detachable cable, and the microphone cuts out often as the presenter is speaking. I think the cable wire has a break in it. Since the cable is detachable, can I purchase a replacement? We first suggest contacting the dealer from which you made your original purchase as they will generally get you the best price. You may also contact Galaxy Audio directly to order a cable. Buying a replacement cable directly from Galaxy Audio will cost $39.99 or $49.99 (depending on model) plus shipping. Q: Can the JIB/S be used to connect an amplifier’s 1/4" powered output to multiple passive speakers? The JIB/S can be used for low-power amplifiers in such applications. The use of high-power amplifiers in this way is not recommended due to the fact that most standard 1/4" jacks, including those of the JIB/S, are rated for only a few amps maximum. Exceeding this amperage/current rating can cause overheating and catastrophic failure of the 1/4" jacks which can, ultimately, damage the amplifier if the contacts short together. Also bear in mind that adding multiple speakers puts a heavier load on the amplifier. Do not exceed the minimum impedance rating of the amplifier. Q: What power supply is compatible with my JIB/MM? The JIB/MM requires 4.5V DC, 500mA minimum with a 4mm barrel connector. Q: Can the Cricket Polarity Tester be used in car stereos where speakers are installed already? For example: with an adapter cable, can the Send unit be plugged into an unbalanced car audio amplifier input? Yes, you need to use an unbalanced 1/4" cable plugged into the send unit with the other end having the correct connector for you input. Most likely a TRS 1/8". You can also record the polarity pulses from the send unit onto a CD and play it through the stereo. Q: Can I connect a microphone on a boom to the Cricket Receive unit to test speakers that I cannot reach? Using a balanced XLR cable, connect your microphone to the Cricket Receive unit and switch from “MIC” to “2-T.” Your Cricket is now using the wired microphone connection instead of its internal microphone. * Make sure you test the polarity of the microphone and continuity of the cable before using them to ensure accurate results. Q: Do the JIB boxes use batteries? The JIB/Y, JIB/S, JIB/C and JIB/S are all passive devices and do not need power. The JIB/MM runs on 2 AA batteries or optional power supply, The Cricket and Cable tester use 9-volt batteries. Q: My condenser mic does not work with my LA4D. Q: I’m using the XLR input on my LA4D, but it is distorted and I can barely turn it up before it is too loud. Q: Will I get left and right when plugging my MP3 player into the 1/8" jack of my LA4D? Q: Will the RM-IRD play apps such as Pandora or Spotify? Pandora and Spotify are subscription-based applications, so the RM-IRD will not be able to run them on its own. The RM-IRD was created to give you access to over 20,000 free radio stations from all over the world. However, you can setup your RM-IRD to stream music from your computer. Please visit pages 15 & 16 in the manual. Q: How many favorited stations I can have on the RM-IRD Radio Portal? We have yet to discover a limit to the amount of radio stations you can save as favorites. Q: I’m not sure what I’m listening to. How can I see the Program Type on my RM-CDU? Press “PTY” to see if your station has a program type assigned to their show. If not, the LCD will display “NO PTY”. Q: How can I see what program service I’m listening to because I only see the station on my RM-CDU? Press “DISP” to switch from Classic, to the Program Service. If a Program Service is not available, it will show “NO PS”. Q: My radio reception on my RM-CDU is not very good, how can I improve it? Make certain the Antennas are located outside of the rack. If needed, an external Antenna may be required in your location. These are readily available from many retailers. 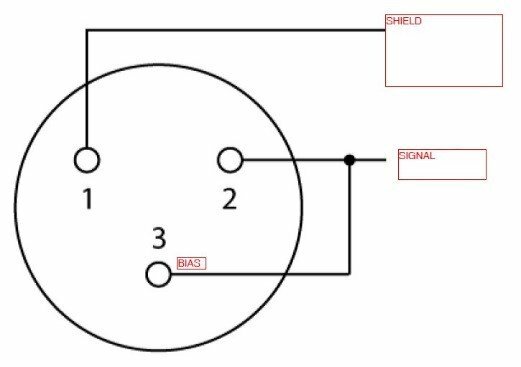 Q: Why can I not cycle through the different modes on my RM-CDU? The RM-CDU will only cycle through its different modes, CD, AM/FM, SD, and USB, if there is media connected. If there is no CD, SD, or USB present, the RM-CDU will not show them when using the MODE button to cycle through these features. Q: How can I scan for a station on my RM-RDSTNR? Press and hold Tuning button for 2 seconds. The tuner will go to the next station. Q: I’m not sure what I’m listening to. How can I see the Program Type on my RM-RDSTNR? Q: How can I see what program service I’m listening to because I only see the station on my RM-RDSTNR? Q: I connected an MP3/Phone/Media Player to my RM-RDSTNR but the volume won’t work. The Tuner volume won’t affect the volume coming from your device. You need to control the the volume on your plugged in device to change volume levels. Q: How accurate is each Checkmate model? Q: What is the difference between frequency response in each model? Q: I think my Checkmate SPL meter’s calibration may be off. How do I get it recalibrated? If you need to verify calibration regularly, we recommend purchasing the CM-C200 calibrator. Otherwise you can send it to Galaxy Audio Service for calibration for a nominal fee. Please contact Galaxy Audio Service: service@galaxyaudio.com or (316) 263-2852 ext. 119 for an RMA. Q: Can I record the audio that is being picked up through the Checkmate’s microphone? On the CM140, CM150, CM160, and CM170 recording can be done via AC output jack (1Vrms at full scale). Q: I get erratic readings outside with my CM-170. Q: How do I use the included software with my CM-170? Q: Is there an AC adapter for the CM170? Q: My CM-170 keeps shutting off after a while. To save battery life, there is an auto shut off after 30 minutes of not touching any buttons this is bypassed when connecting to a PC, or while logging. Q: Where can I find the latest CM-170 data-logging software? Q: My computer will not sync to the CM-170. Do I have the correct driver? Q: Is the software for the CM-170 compatible with Apple/Mac OS? As of right now, the software is only available for Windows. However, it will work with desktop virtualization software like Parallels. Q: Why does my Traveler only work on AC power? / Why does my Traveler not last very long when running on battery power? If it is discovered the charging circuit is not producing current, contact the Galaxy Audio Service Department for assistance at service@galaxyaudio.com or (316) 263-2852 ext. 119. Q: How long does Galaxy Audio warranty Traveler batteries? Batteries found in the Traveler series are warrantied for 90 days from date of purchase. Q: I need to replace my Traveler’s batteries. What type of batteries does my Traveler use? L: 3.54 in. W: 2.76 in. H: 4.21 in. L: 3.54 in. W: 2.76 in. H: 3.98 in. Q: Does my AudioLink Transmitter module transmit all audio that my Traveler passes? Yes. The AudioLink transmits the same signal to the slave unit as is heard from the master unit. Q: Why is my SD card / USB not playing music through my RM-CD or RM-DIGIMP? Check what type of file you saved you your audio as and make sure they are not inside individual folders. These media players are designed only to play .mp3. If you have your music saved as .mp4 or .wav, the player will not recognize them. There are many programs available elsewhere you can use to compress your .mp4 or .wav into .mp3. Q: I have misplaced or broken my power supply/power cable. Where can I get a replacement? If you are in need of a replacement power supply for the TV5i or TV5x (PSU-20-3.25-5.5), please contact Galaxy Audio at (800) 369-7768. If you are only in need of the power cable, these are standard, 7 ft. IEC power cables that are available almost anywhere that sells electronics. Q: What is the Echo on my TQ6 for? To enhance singing for karaoke, etc. Q: Can I connect a mixer XLR output to CH1 XLR input on my TQ6? The XLR input is mic level, a line level mixer output will cause it to distort. Q: Can the MP3 player and CH1 mic input on my TQ6 be used at the same time? Yes, all inputs are available simultaneously and levels mixed with individual controls. Q: Will the TQ6 run on AC power if the battery is dead? Yes, and it will charge the battery while in use. Q: How often should I plug the TQ6 in to charge? It is recommended to leave it plugged into AC when ever it is not in use. Always charge after each use. Do not store with battery discharged. Q: Can multiple wireless systems be used at once, including combinations of in-ear monitors and wireless mic systems? Absolutely. However, when implementing multiple systems, proximity to other electrical/electronic equipment (including other IEMs and wireless mics), antenna orientation, and external RF interference from other sources (e.g. radio/television transmitters and/or other wireless systems) operating within the same frequency band must be taken into account to maximize performance. Our Galaxy service department can assist you in determining the best frequencies to use. Q: My wireless monitor/microphone system is on and everything appears to be functioning correctly, but I am not hearing any audio. Galaxy Audio has systems available in multiple frequencies and/or frequency bands. Most of the wireless components have a sticker on the back or in the battery compartment that provides frequency information. Verify that all components of the system are labeled with the same frequency range and set to the same group/channel where applicable. If another transmitter or receiver is available, test it in the same situation to verify a problem component. Q: What antenna does my wireless system use? Q: What is the best way to find the clearest channel on my wireless system? A few factors need to be considered when trying to find the best frequency to use and to achieve the best performance from a wireless system. Determine what TV stations are broadcasting in your area and the channels they are on. Using your zip code, you can find this information from several websites such as www.tvfool.com. Avoid using frequencies occupied by TV stations. Some of our wireless systems (DHX, CTS) have a search function to help find a clear frequency. If you are using multiple systems contact service@galaxyaudio.com for assistance. Consult our wireless tips located on our website. Q: Where can I find out what frequencies are available on my wireless system? Q: We have a lot of wireless systems and are having trouble getting the frequencies coordinated even using the scan function. Contact our service dept. at service@galaxyaudio.com, we will be glad to assist you. Q: I’m having problems finding the best frequency for me. Where do I go to find this information? Q: I only have 1 coupler half, why only 1 and what is it used for? Q: How should I position the Antennas? They should be at about 45 degrees outward from a vertical position in each direction. Q: My handheld microphone is much louder than my lapel mic. Start with the level control for the handheld channel completely off, & the lapel channel completely up. Adjust the system level till the lapel is at a good volume. Now slowly bring up the handheld channel volume up till it matches the lapel. Q: My audio sounds clear, but I’m randomly getting complete cuts in audio. Why? DHTRQUAD & DHXR4: 2, 4, 6, & 8 will control the squelch from LO, MI, & HI. Q: What is the maximum number of transmitters that can be used with Galaxy Audio’s wireless mic systems (ECM/PSE/ECD/EDX/TRC/DHT/DHX/DHTRQUAD/DHXR4/CTS)? In contrast to receivers, only one transmitter per system can be used. You cannot have multiple transmitters on the same frequency. Q: How do I sync my wireless mic to the receiver? Q: It says the CTSR has 920 selectable frequencies. How do I access all of them outside the default groups and channels? Press set, use the up/down arrows to go to group U or IU, press set again, use the up/down arrows to choose a channel, press set again, the first 3 frequency digits will start flashing, use the up down to select the desired MHz, hit set again and the next 3 digits will flash, use the up down to select the desired kHz, press set two more times to set and exit. Q: How do I create a user group on my CTS? The user groups are already there labeled U and UI, you just need to set the frequencies, see above! Q: How does the auto scan feature on my CTS work? When pressed, the auto scan will scan the current group setting to see how many channels are clear to use within that group. After it scans, it will show a number corresponding to the number of clear channels in that group. Using the up down arrow keys, you can select one of those clear channels. If the scans shows there are no, or very few open channels, select another group and repeat the scan procedure. Q: I have multiple CTS systems, how should I set up their frequencies. Start will all transmitters off, use the scan function on the first receiver to find a clear channel, turn on its transmitter and use the ADS function to sync them. Leaving the first transmitter on, move to the second system, and repeat the process. Continue this process till you have programmed all of your systems. Q: I have other systems that are not Galaxy, how do I coordinate frequencies with those and my CTS? Turn on all of the transmitters of your other systems before beginning the scan process with your CTS systems. Q: What are the groups on the CTSR labeled U and U1? These are user groups. These groups can be filled by selecting frequencies using the sets mentioned above. Q: How do I use the Scan function on my DHX? 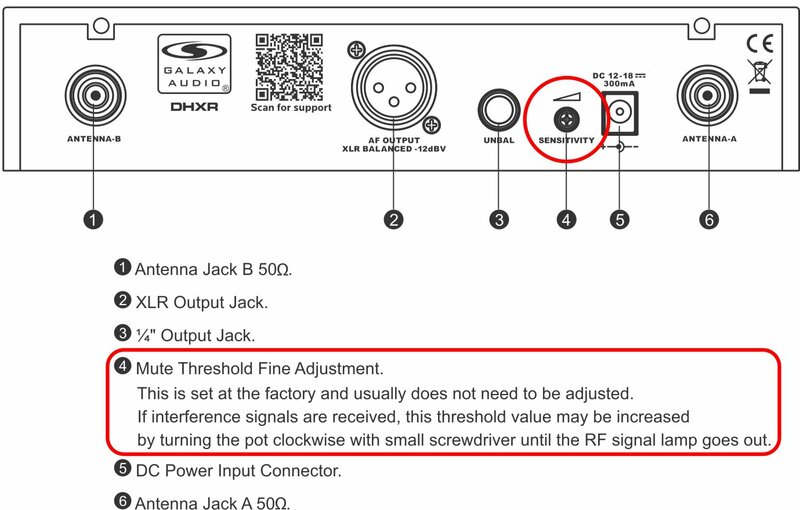 Q: My other wireless systems are interfering with my DHTR/DHXR Wireless Microphone. What can I do? Re-adjust the frequencies of the other wireless systems or the DHTR/DHXR and attempt to keep at least .5MHz (500kHz) between chosen frequencies. Try using the “Auto Scan” function to find the best available frequency. If using the Auto Scan in multiple systems, power on a corresponding transmitter when an open frequency is found to prevent other receivers from choosing the same “open” frequency. Q: I’m using channels on the same group on my DHTRQUAD/DHXR4 and having issues. It is ok to use multiple groups if you cannot get all channels to work within one group. Q: With my transmitter off, the RF and AF lights on my PSE/ECM are both on, and I get a lot of noise. You are picking up outside interference and you need to change your frequency. Q: Which setting do I use on the PSE/ECM body pack transmitter? For a headset or lapel microphone use “MIC”, for a line level input use “0dB” and for a guitar use “-10dB”. Q: What is the maximum number of receivers that can be used with Galaxy Audio’s in-ear monitors? There is no limit to the number of receivers that can be used to listen to one transmitter -- just as there is no limit to the number of radios that can tune into a radio station or TVs to an over-the-air television broadcast channel. Q: Do the Galaxy IEM systems have built in limiters? Yes, they are fixed limiters to provide the best performance. Q: I’m getting static, pops, crackling, and/or random cut outs in audio in my in-ear monitors. Does this mean I got a defective system? Not necessarily, these could be signs of interference. Your system may be on a frequency that is not suitable for your location and/or existing audio equipment. Below we have a guide on how to eliminate interference. You can also contact Service@galaxyaudio.com for help with frequency coordination, and trouble shooting. Q: Can I use ear buds other than the supplied EB4? Yes, you can use any headphone or earbud with an impedance of 16 ohms or higher. Q: I only have one Aux output available on my mixer, and the sound is only in one ear. On the back of the transmitter, you will see a “MONO / STEREO” switch, move it to the appropriate mode. Q: Can you have more than 1 mix on the AS-900 or AS-1100? You will need another AS-900 or AS-1100 system on a different frequency for each mix. Q: I barely turn the input level up on the AS-1400 transmitter and the input meters go all the way to the top. Move the PAD switch on the back of the transmitter to the -12dB position. Q: My AS-1400 get lots of static and dropouts. You are getting outside interference. Turn the transmitter off, and turn the belt pack on, if the green RF light on the front of the receiver is on, that indicates it is picking something else up. Try setting your receiver on different groups and channels until the RF indicator no longer lights. Now turn your transmitter back on, and set it's group and channel to match those now on the receiver. Q: Using my AS-1400, I only have one Aux output available on my mixer, and the sound is only in one ear. On the front of the transmitter, press the SET button 3 times, you will see “STEREO” flash in the display. Use the down arrow key to select “MONO” and press set again. Q: Our singer complains there is not enough vocal in the mix using the AS-1400 or AS-1800, but the rest of the band thinks it’s perfect. Maintain line ­of ­sight between the transmitter and receiver antennas. Do not have walls, metal objects, large crowds, etc. blocking the line of sight between the transmitter and receiver. Antennas on the stationary equipment should be kept 6'-8' feet above the ground. Avoid having the antennas inside racks. Keep antennas at least 3' away from metal, this is especially true of the ANT-PDL. On body pack receivers/transmitters, avoid putting them in your pocket, and/or folding the antenna under the pack. The antenna should hang freely and openly. Keep the distance between transmitters and their receivers as short as possible. If you have IEM systems and wireless mic systems, keep the IEM transmitters at least 6' or more away from the wireless mic receiver. If distances above 20-30' are unavoidable, directional antennas such as the ANT-PDL can improve reception by rejecting signals outside their pickup angle. Transmitter antennas should be separated from each other. Find out what TV stations are broadcasting in your area and avoid the channels they are on. This information is available from many sources on line, such as www.tvfool.com. If your receiver is showing that it is receiving RF when your transmitter is turned off, you need to move to another frequency. There are many things other than wireless systems that generate RF and can cause interference; video walls, organs, radar, bad switches and relays, guitar pedal boards, etc. If you are using several systems, you can contact service@galaxyaudio.com for assistance in frequency coordination. Make certain you are using fresh batteries, rechargeable batteries may be used, but they discharge at a much faster rate than alkaline. Battery gauges will not be accurate using rechargeable batteries.